The Kingdom of Thailand is in Southeast Asia. It occupies the southwestern section of the Indochinese Peninsula and the northern section of the Malay Peninsula. “Thailand”, the English version of the country’s name, was introduced in 1939. The Thai variant is Prathet Thai or Mueang Thai. The word “thai” (ไทย) translates as “freedom”, and that name is fully justified: Thailand is the only country in Southeast Asia that has preserved its independence from European countries, while all its neighboring countries were colonized by France or Great Britain. Thailand is an agro-industrial country. According to the department of national and social development, in 2012 Thailand’s GDP amounted to 11,375 trillion baht (366 billion USD) in current market prices. Half of the working population of the country is engaged in agricultural work. This industry makes up 10.7% of the GDP. The country’s main agricultural product is rice, the crops of which occupy a third of agricultural land. Industrial crops are also grown: sugar cane, cotton and jute. Fishing plays an important role (3 million fish per year). 14% of the working population is engaged in manufacturing. This industry makes up 44.5% of the country’s GDP. 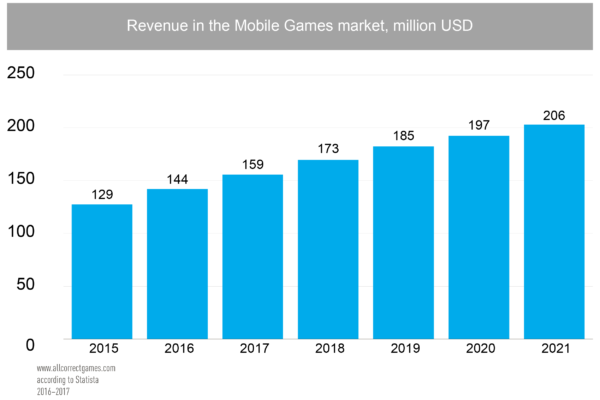 In 2017 the mobile games market revenue exceeded 159 million USD (275 million USD according to data from Newzoo). Estimates suggest that this figure will increase by 6.7% annually and will reach 206 million USD by 2021. 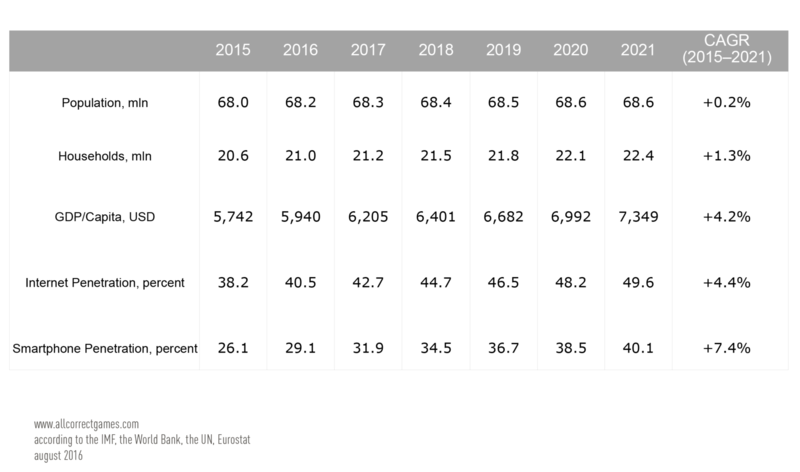 In 2017, 12.1% of residents used mobile devices, and this is expected to be 11.9% by 2021. 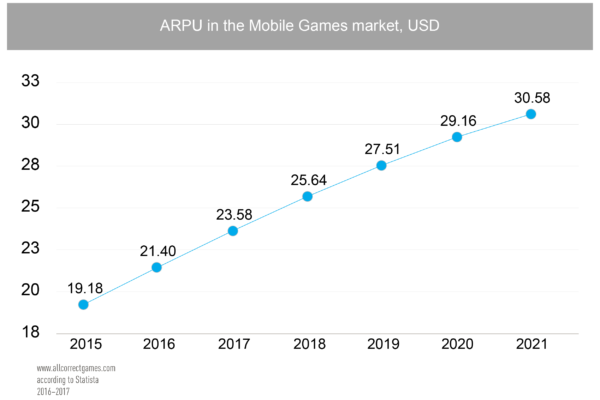 Average revenue per user (ARPU) is USD 23.58.  Average CPI in the country: for iOS – USD 0.91, for Android – USD 0.53. 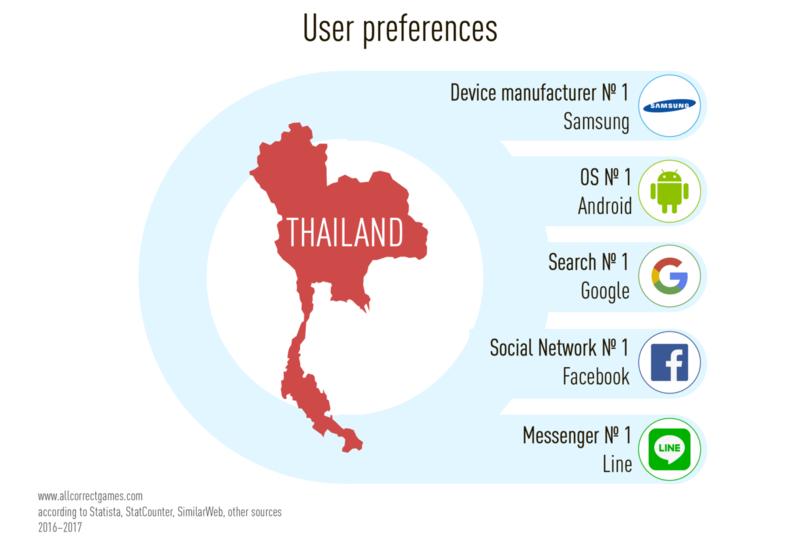 In Thailand, the dominating operating system, social network, messenger, search engine and device manufacturer are Android, Facebook, LINE, Google, and Samsung respectively. 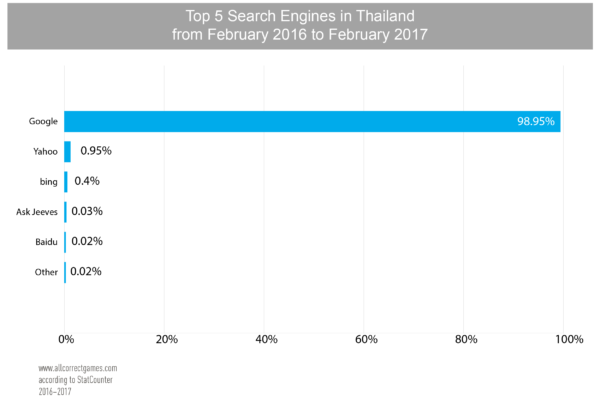 According to VC firm KPCB’s 2016 Internet Trends report, online buying in Thailand often occurs entirely over mobile, from social media for browsing to messaging platforms for payment. 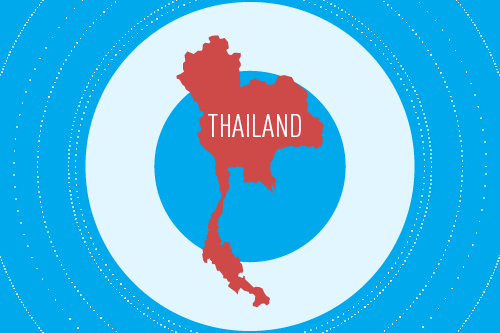 The use of messaging as a platform for monetization online will continue to be a trend in Thailand. Who plays mobile games in Thailand? According to Naver Corps’ LINE brand, a heavyweight in Thailand (we’ll get to this in a second), Thai users, on average, spend roughly 5.7 hours a day on their mobile devices. 4G networks are being further expanded this year. 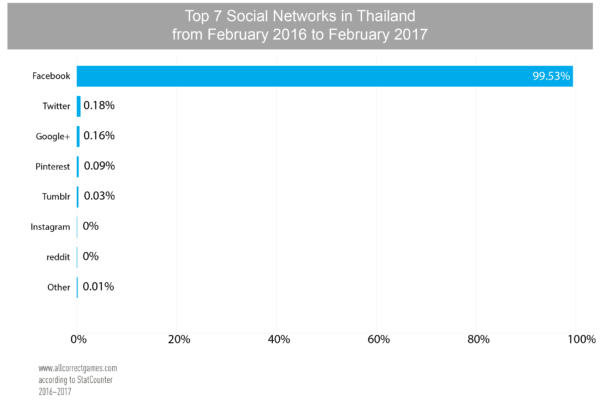 Roughly 40-50% of Thai smartphone users access social networking, instant messaging, and online videos daily – one of the highest percentage of daily users in the whole region. Racing games is the most popular genre among Thai mobile gamers who spend money on games. The average spender is between 21 and 35 years of age and 55% of these gamers are males. 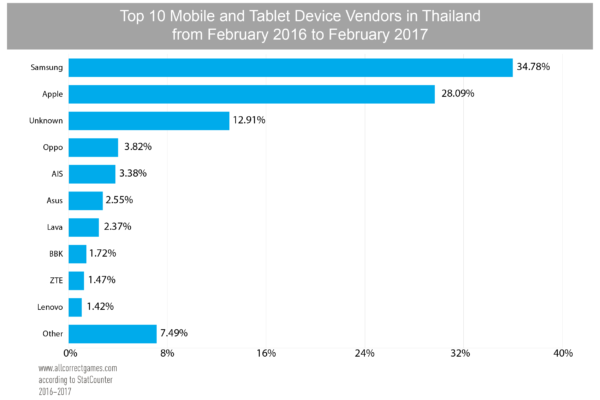 Given the fact that Thailand ranks 9th on the Google Play Store in terms of app downloads, this means there is a lot of potential here for app developers to grow their app business. 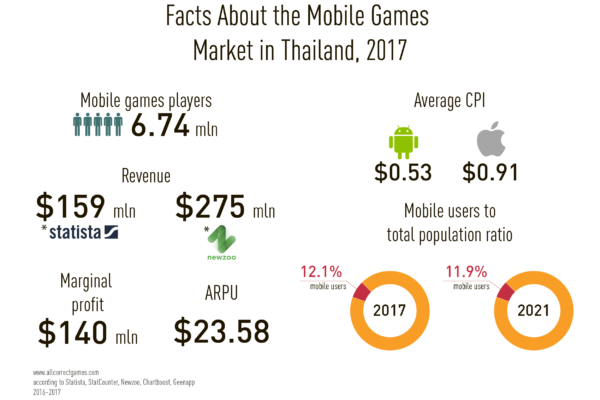 However, if you’re a game developer from Southeast Asia, here’s something that you should know: only 35% of the top games in Thailand come from app publishers from the West, the lowest among all Southeast Asian countries. Top global game publishers such as King and Supercell are by far the most dominant western publishers in the Top 20. 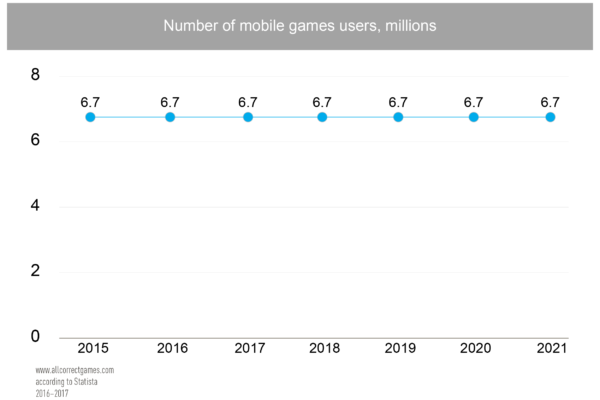 Mobile games originating from Asia are largely popular among Thai gamers and this means there is tremendous opportunity for game developers from Asia to win in this market. The Thai language is a member of the Tai group of the Tai-Kadai language family and is the official language of Thailand. 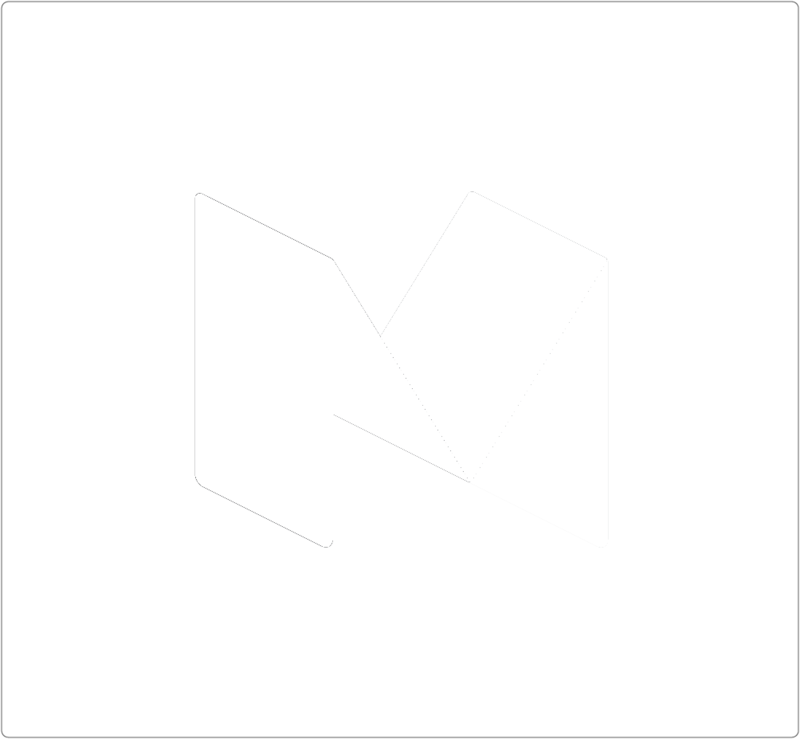 It has roughly 60 million native speakers. Thai has no punctuation marks such as the comma, semicolon, question mark etc. As in English, words in Thai sentences are written from left to right. However, they are not divided by space marks. Sentences are divided from each other not by full stops, but by space marks. Interesting fact: Thai is one of few languages that has its own digit symbols. It’s worth noting that in day-to-day life, particularly among the last 10-15 years, Thais practically never use their own numbers, but instead use Arabic numbers. This is linked to the fast development of Thailand and its close economic ties with other countries, along with its large share of organized tourism. LINE is a particularly interesting example of successful localization, as well as a leader of the local app market. As one of the company’s biggest markets outside its native Japan, LINE in Thailand has taken the time to develop multiple platforms and products catering to local users’ needs (for example, separate apps for TV, music, camera, selfies, you name it.) 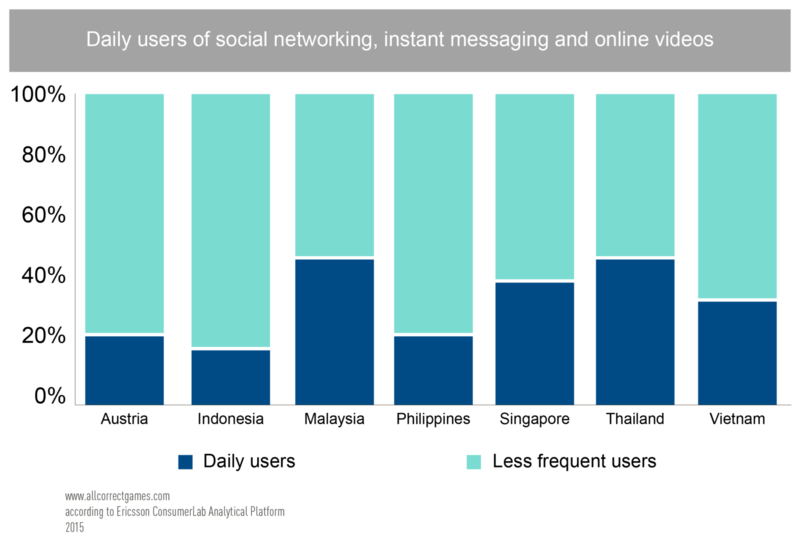 In general, the primary user demographic in Southeast Asia is young, educated, and single. LINE’s knowledge of this led them to create features and products tailored for this crowd. 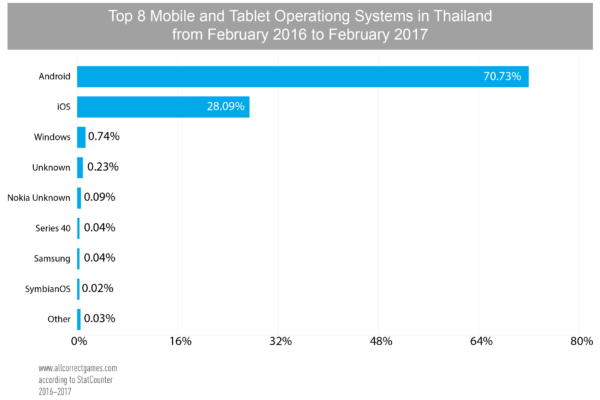 Whereas mobile games lead in revenue in Thailand, LINE tops the charts in combined iOS and Google Play downloads. In fact, 2 out of the top 10 games in 2015 were developed by LINE. Thailand’s English proficiency ranks very low in the world, and only about 27% of its population speaks English. Western games that have seen the most success when localized in Thailand have all committed to full localization for their games. These games represent half of the top grossing games in Southeast Asia and 35% of the top games in Thailand. King and Supercell are the most dominant Western publishers, but some smaller indie studios have seen success as well, like Playlab. Even as an established leader in Thailand’s app market, LINE recently ran into trouble with the local government over “culturally insensitive stickers” on their messaging platform.